BBVA – Spain’s second biggest bank – describes the 4% increase in house prices announced by the National Institute of Statistics (INE) as a “typical bounce back” after house prices fell too far in the crisis. Recent figures from the INE reveal that average Spanish house prices rose 4.02% over 12 months to the end of June, by far the biggest price increase since the Spanish property bubble burst in 2007. 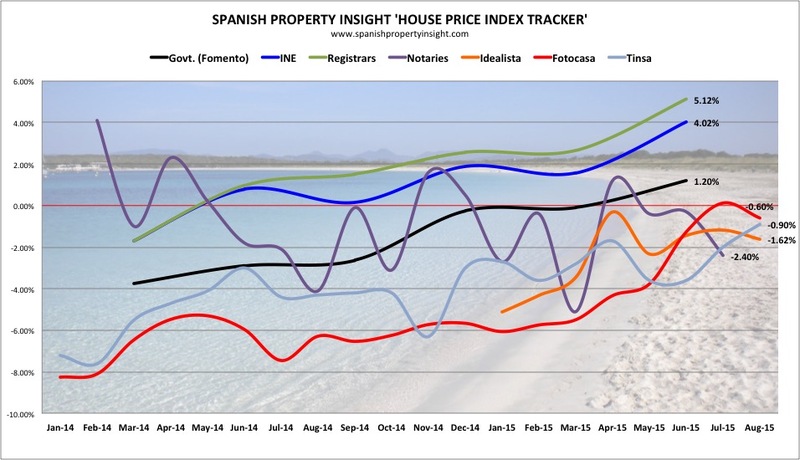 However, other sources of house price data suggest that Spanish property prices fell in the same period, as illustrated in the SPI Spanish House Price Index Tracker, so the premise of rising house prices does not need to be taken for granted. On the other hand, BBVA point out that the return to growth comes from a very low base, which helps to make a small level of absolute growth look large in percentage terms. And after house prices have fallen as much as 80% in some segments, a recovery of 5% or even 10% still leaves prices a long way from where they were.